Flygtorget » Platsannonser » CityJet » Would you like to join an airline that’s going places? CityJet, Europe’s leading wet lease provider with tailored solutions for airlines to deliver their regional capacity requirements is now looking for a Pilot Manager to join us at our Arlanda base. 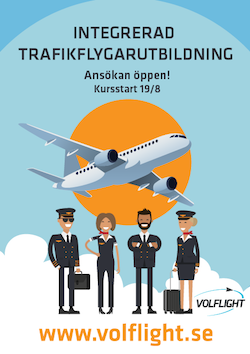 We are looking for an engaged and people focused Pilot Manager to our Arlanda base who will be our front-line non-technical pilot manager in the crew base. The Pilot Manager will be working closely with the Pilot community, Flight Operations senior management and HR and will be responsible for all aspects of pilot non-technical management, to drive engagement and to uphold high crew standards, as well as to implement the Flight Operations agreed objectives. This role will report to the Regional Base Captain, based in Helsinki. We are looking for someone with a passion for and a background in, aviation. You will have management experience, are highly motivated with excellent people management skills and with an ability to communicate and influence at all levels. Good IT and administration/analytical capabilities. The Pilot Manager will be the interface between the business and the pilots, and act as an ambassador of the CityJet ethos, culture and way of working. The role is full time, office based at our Arlanda office in Sky City. Flexibility regarding working days/roster as well as regular travel will be required within the CityJet network. - Track and report on pilot costs at local level. - Achieve Flight Operation’s and local base KPI´s and targets. - Responsible for Base communications and submission of Base reports to GMFO and Regional Base Captains. - Processing flight crew requests liaising with HR. - Manage local trade union relationship in conjunction with HR. - Monitor office equipment and responsible for crew supplies at the ARN Crew room. - Responsible for local external stakeholder liaison. - Day to day administration and reporting, support local pilot recruitment as necessary in conjunction with HR and any other duties as may be requested from time to time. - Background in and experience from Aviation. - Experience from leading and motivate a large team. - Excellent English communication skills as well as being able to effectively communicate in a Scandinavian language. - Excellent analytical and written skills. - Proven track record from operational delivery. - Microsoft Word, Excel and PowerPoint proficient. CityJet is Europe’s leading wet lease provider with tailored solutions for airlines to deliver their regional capacity requirements. The Company is based in Dublin, Ireland with bases across Europe, operating a fleet of Avro RJ85 Bombardier CRJ700 & 900 aircraft on scheduled and wet lease services. To discover more, please visit www.cityjet.com. The position is full-time and planned to start as soon as possible. Sounds interesting? If so, we encourage you to submit your application latest the 7 May, interviews will take place continuously as we receive applications. CityJet is an equal opportunities employer.